Save $45 (or more) on your membership! STUDENT MEMBERSHIP SALE – September 1 – 30, 2018! Just show us your valid Washington State Student ID and get a monthly AUTOPAY Membership with a $5 Start-Up Fee! That’s a savings of $45 for students and $55 for teachers. • Free! FITNESS CLASSES: Yoga, Pilates, Strength, Core and more! • 10% OFF Retail Pro Shop purchases, including a full assortment of climbing shoes and harnesses! Remember, the SALE ENDS SEPTEMBER 30TH so be sure to take advantage of this deal! We can’t wait to see you in here climbing. Membership rates are based on ACH billing (direct debit to a checking account); credit cards are subject to a 2.8% convenience fee. Aleksa: We all started light rock climbing while living in Boulder, Colorado. It is a fun and challenging activity for all of us! Aleksa: Our family climbs at Edgeworks because it is so family friendly, easily accessible, and also has a wonderfully fantastic and positive atmosphere. Aleksa: When we’re not climbing, we can be found hiking, park hopping, biking, occasionally Geo-Caching or running. Aleksa, Anora and Ember also enjoy participating in karate 3 to 4 times a week. Aleksa: Top rope and bouldering have been top on our list so far. Aleksa: Interesting facts about the family include Anora’s ability to whistle a variety of songs, especially Star Wars themed; Ember is an aspiring artist, with a focus on animals; Aleksa loves to cook anything vegetarian or vegan, and Sam enjoys long and grueling bike rides, and consuming any pork product he can get his hands on. Aleksa: Sam’s go to routes are 5.10 to 5.11, Aleksa works on 5.8 and 5.9, Anora can handle 5.7-5.9, and Ember will climb anything from a 5.6 to a 5.10! Want to learn what it takes to be a route setter? Here’s your chance! Join Edgeworks’ head route setter, Joe Stangel, for an evening of pure route setting joy – Monday, September 10th, 5pm – 9:30pm. This is a beginner clinic designed to introduce climbers to the art of route setting. You will learn basic setting practices, have the opportunity to set your very own boulder problem, and get professional feedback. 6 spots available for each session; 18 total. 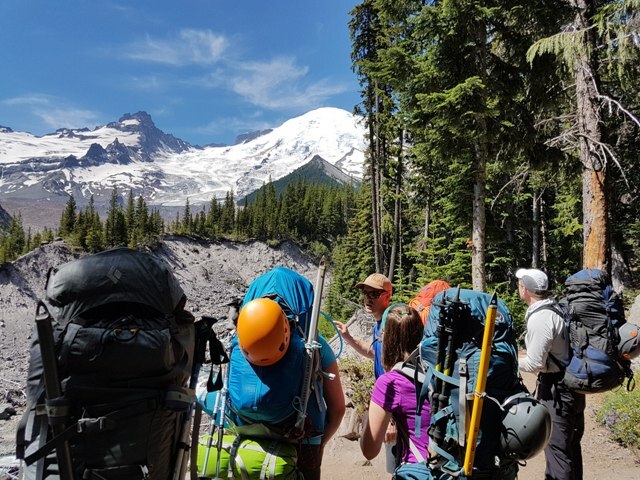 On July 15, 2018, Edgeworks’ head guide, Tod Bloxham, 4 guests, and I gathered at the gym to prep gear and drive out to the White River Ranger Station to begin our journey up Mt. Rainier. The forecast was good, if a bit too hot. We knew the sky would be clear and that there would be a lot of sunscreen in the coming 4 days. What we didn’t know, is that the standard Emmons-Winthrop route was rapidly falling apart. The first day was an approach hike into Glacier Basin. The views of the route and mountain on the way to this camp are phenomenal and it serves as a means to ease into the 10’000ft gain of our trip. We enjoyed each-others company, told stories, and spent the evening generally relaxing and appreciating the views. Day two was allocated for snow skills training and the push to Camp Schurman. After a hearty breakfast and a casual start, we moved up the mountain and dialed in some essential climbing skills, like self-arrest and efficiency in snow travel. 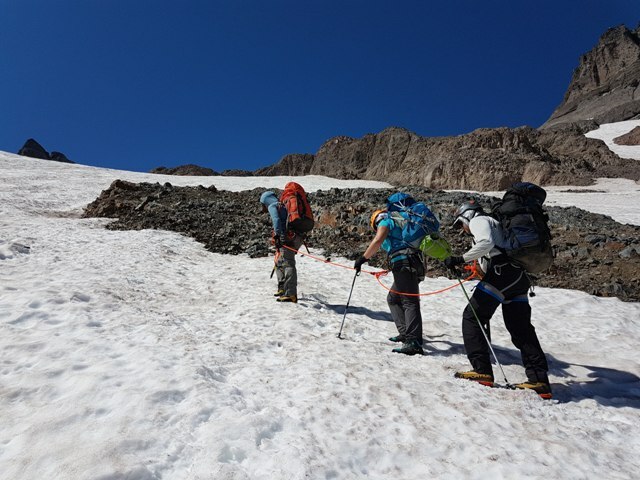 As we continued up the mountain, we began to receive reports from other groups who were on their way out of hazardous conditions on the route, including collapsing snow bridges and at least one crevasse fall that required climber extraction. This news was a bit ominous, but Tod and I remained optimistic. 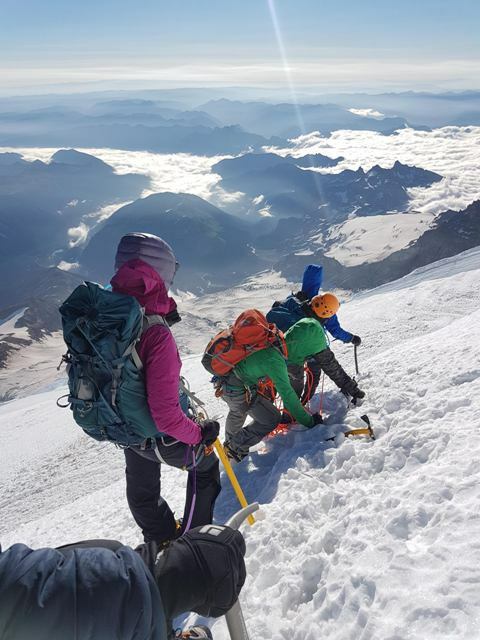 Upon reaching Camp Schurman, the climbing rangers on sight gave us a run down on conditions. The standard route was no good and success would require a much more challenging and steeper route. Due to the daytime heat, we opted to rest and use the day to acclimate before having an early dinner and setting out for a 9pm start toward our objective. This allowed everyone to recuperate their energy reserves, and to mentally prepare for the big day. It also gave us the best possible snow conditions for the climb and descent of Mt. Rainier. We were roped up and ready to climb by 8:40pm and climbed through the night. We started out onto the Emmons Glacier via the standard bridge crossing out of camp. This was straight forward and the crossing over to “The Corridor” at 10,200’ was simple. This is where the reports of hazardous conditions and weak bridges were coming from. The climbing rangers advised us that staying climbers right in the more exposed terrain was the best path, as opposed to the typical “up the middle” path. Part way up The Corridor, I checked my altimeter and realized that we were going to make it. The team had ample time to rest and everyone was climbing strong. We were moving up the mountain faster than expected while maintaining a sustainable pace. At the top of The Corridor, the standard route leads climbers right to the “The Alpine Meadow”. The heat of the previous two weeks had obliterated this path, and it was in a right state. The alternate was to head climbers left into a large, steep bowl. This proved straightforward, but steep and icy. The cramponing was excellent, but the grade was unrelenting. For hours, we toiled upward; traversing and climbing slopes that make the standard route look easy. We trended far right at the top of the bowl to cross the final bergschrund, and reached the summit at about 5:30am. We had climbed through the night, seeing both an amazing sunset and a glorious sunrise on route. The descent took us a fair amount of time, as the slopes were so steep. After some food, rest and packing up camp, we headed out to the parking lot and the Edgeworks van. The trip was a great success and we are super excited for next season! Our newer, taller walls bring better endurance training, new styles of routes, and all new projects! Unfortunately, this can also mean serious neck pain for your belayer. Feeling the strain of the new wall and looking for a little relief? Metolius’ Upshot Belay Glasses have got your back! These belay glasses are an updated take on the original, with a field of vision that aims higher on the wall, sports-style temples with low profile nose pads that fit better over glasses/sunglasses, and increased peripheral vision. They also come with a durable case that will protect them when you throw them in your bag for a day of climbing in the gym OR at the crag. Next time you’re in the gym, ask about trying them out. Your neck will thank you! Global Climbing Day marks the culmination of The North Face’s Walls Are Meant For Climbing campaign, a global movement to bring people together through the power and community of climbing. For every participant that day, TNF will donate $1 to the Khumbu Climbing Center in Nepal, an organization dedicated to teaching responsible climbing practices through community-based programs. We see walls as a place to unite our community through the sport of climbing – a sport that requires trust and partnership. The purpose is to inspire us all to think more hopefully about the community we can build – as climbers, as outdoor enthusiasts, as believers in the good of humanity. Edgeworks is proud to partner with The North Face and bring this inspiring global initiative to the Puget Sound. Join us in the gym, Saturday, August 18 from 2pm – 5pm, and help us grow & diversify the sport of climbing. • FREE Intro to Climbing Course* with purchase of day pass. • Opportunity to win FREE Raffle Prizes from The North Face and other retailers. * Classes offered at 2pm, 3pm & 4pm. Must be 14 or older. Space is limited, SIGN UP ONLINE. Only in town for the summer months? Then this is the Edgeworks membership for you! Purchase now to get the most out of this awesome deal – 3 months of climbing, fitness classes, and socials. PLUS, unlike our 30-day intro passes, you’ll also get to enjoy all the great perks and benefits that come with being an Edgeworks member including guest passes and discounts on our outdoor days! Summer memberships expire August 31, 2018 regardless of purchase date.